EDITOR'S NOTE: Bags may be dropped off at the Artisan Depot during regular hours: Thursday, Friday, Sunday Noon to 5:00 pm, Saturday 11:00 am to 5:00 pm. Meetings for this project will take place at the Artisan Depot on Wednesdays beginning in May at 10:00 am. Something most of us probably never think about is how uncomfortable it can be for people forced to sleep outdoors. Bedding materials get wet, and people get wet and cold. In the summer, pavement gets really hot. These conditions can be dangerous for people who already struggle and may have health problems, too. A dedicated group of ladies at the Franklin County Arts Guild have been crocheting mats that can be used by anyone who sleeps outdoors. The mats are made from “plarn,” plastic yarn made from plastic grocery bags. The mats are easy to make, are lightweight and waterproof, and provide cushioning as well. To expand their efforts, the Franklin County Arts Guild group is starting an ongoing workshop to create more mats. The community at large is invited to participate, and there is no charge for the workshop. Gathering Materials – During the month of April, the Artisan Depot (the gallery of the Franklin County Arts Guild) is gathering plastic grocery bags of the type given at Kroger, Walmart and Dollar General. The bags should be clean and dry, right-side out, sorted by color, folded neatly (to be as flat as possible), and placed in the yellow recycle container located under the Intake Table in the Art Supply Corner at the Artisan Depot. All who plan to participate should bring approximately 100 bags to be used for their sleep mat and, if you crochet, a size Q (15.75 mm) crochet hook, scissors or a cutting board, a straight edge and rotary cutter for construction of their sleep mat. Crocheting the mats with a single crochet stitch. The sleep mats will be distributed to a homeless mission in Nashville by the Harmony Cumberland Presbyterian Church, Winchester, the Belvidere Family & Community Education (a program of the University of Tennessee Extension Service) and The Journey Church in Winchester. Pastor Kelly May of The Journey Church opens its doors to the homeless during freezing weather. In addition to being very useful to homeless citizens, making the mats takes plastic grocery bags out of the waste stream. The odd pieces (like handles) left over from the plarn-making process will be taken back to Wal Mart for recycling. If you’d like to participate in this project, please contact Joyce Adams at 931-962-0280, a volunteer at the Franklin County Arts Guild and The Artisan Depot Gallery & Gift Shop. There is plenty to do for everyone. Even if you don't crochet, you can collect bags, make "plarn," etc. The Artisan Depot is located at 204 Cumberland Street East in Cowan, Tennessee. For questions about the Franklin County Arts Guild, the gallery, or this project, please click here to email us. Andy Gay has spent most of his life in southern middle Tennessee where he has been fascinated by the natural beauty of wildflowers, rocks, and woodlands. Now in retirement, he has been free to again pursue his passion for watercolor. 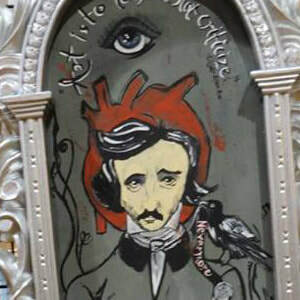 He has twice had paintings in the Tennessee All State Exhibit at the Parthenon Gallery in Nashville, an exhibit of a judged competition sponsored by the Watkins Institute. Although Andy began with acrylics and some pastel chalks, he long ago gravitated to transparent watercolor. Having utilized digital media in local church publications and web sites, he continues to use digital photography for design and reference. But it is the unique capacity of watercolor – to surprise and reveal – that draws him. All the work in the "Between the Rocks" exhibit seeks to recreate some aspect of the experience of places Andy Gay has been. Two such places where he spends a lot of time are the trails of the South Cumberland, especially Shakerag Hollow in Sewanee and Ghost Ranch in northern New Mexico. Whatever the setting, he looks between the rocks, and all the other “between” places where the great and the tiny, the hard and the delicate, co-exist in beauty, illumined by the multivarious moments of changing light and texture. Andy Gay is a Tennessee native, living and working in Sewanee, Tennessee. The public is invited to the opening exhibit of his show at the Artisan Depot. The gallery is located at 204 Cumberland Street East in Cowan, Tennessee. For more information about the Franklin County Arts Guild and the Artisan Depot, click here. 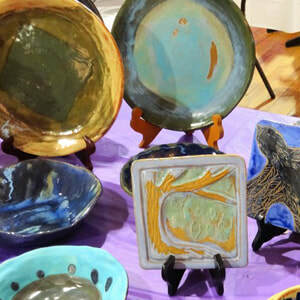 ​Once again, the community turned out in force to support the arts in Franklin County and beyond. Over 300 people attended Arts & Ales 2019, making it a big success. Proceeds from Arts & Ales continue to fund the Franklin County Arts Guild's scholarship program, the Artisan Depot gallery space for local artists, and art workshops for the community. 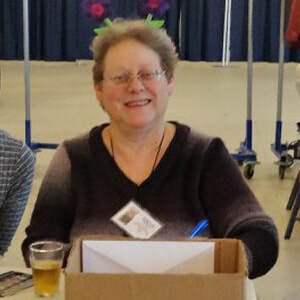 ​She continued, "The Guild is made up of members who give their time, creativity, and financial resources, not only to Arts & Ales but to the many other projects that make the arts an enriching part of life in our community." There were also many people who jumped in and volunteered to help with: setting up tables and chairs and, afterward, cleaning up, sweeping, mopping floors, cleaning bathrooms, and sorting recyclables. Thanks also to all the volunteers and members who brought art and sold tickets, checked ID's, gave out glasses, greeted guests, and did all the other things that made this event so much fun for everyone. A party wouldn't be a party without live music and, once again, The Secret CommonWealth and Patton James and The Synchromatics entertained the crowd mightily. Last, but in no way least, the Guild wishes to thank everyone who attended Arts & Ales. You make it possible to give a $1,000 scholarship to a Franklin County student and have put the Guild well on its way to endowing the scholarship fund in perpetuity. You also help to keep our gallery, The Artisan Depot, the wonderful place it is that serves our community in so many ways. The Franklin County Arts Guild promotes the arts and arts education in Franklin County, Tennessee and beyond. Its gallery, The Artisan Depot, is located at 204 Cumberland Street E in Cowan, Tennessee. Click here to email us for more information. What about the "ales" at Arts & Ales? Arts & Ales is the annual fun-raising event for the Franklin County Arts Guild, so of course there is art -- great art by local artists -- and you can get some great deals on art you will love. And while you are shopping the art and watching local artisans do their thing, you'll be sippin' samples of craft beers from brewers here, near, and far. Samuel Adams | Lagunitas Brewing Company | Terrapin Beer Company | SweetWater Brewing Company | Dogfish Head Craft Brewed Ales | Ballast Point Brewing Company | Highland Brewing Company | Fat Bottom Brewing | Singin' River Brewing Company | Chattanooga Brewing Company | Catawba Brewing Company | Yee-Haw Brewing Company | Sierra Nevada... and Tullahoma' very own Ole Shed Brewing. Making their first appearances at Arts & Ales are Stone Brewing and Gypsy Circus Cider Company. And, the Backwoods Car Boys will be on hand with samples of home brews and a display of steps in the small-batch brewing process. Did you ever look at a piece of art, or a beautiful piece of craftsmanship, and think, "Wow. How'd they do that?" Now you can find out. Several of the creative people in the Franklin County Arts Guild will be plying their trades at Arts & Ales on Saturday, March 9 from noon to 4:30 at Monterey Station in Cowan. You can watch them, and some may even let you try your hand! ​Acrylic pouring is very popular, and it's just one of the mediums that artist Denise Miller works in. It is a technique that produces spontaneous, flowy, soothing images. Said Denise, "I enjoy watching colors swirl around me, making patterns. I find it all intensely satisfying." Come watch create this fascinating art. Since Arts & Ales is, after all, about craft brewing, the Backwoods Car Boys will be there again this year, demonstrating the art of home brewing. They will also have samples of their creations for tasting. These guys are have a wealth of information about making your own beer, and they have generously supported Arts & Ales for several years. Be sure to stop by to see how they do it. Melanie Villegas painted and sold furniture in Winter Park, Fl. prior to moving to the Tennessee Plateau with her husband, Tom, in 2006. 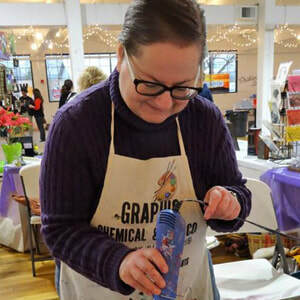 She will be giving a demonstration of “Charmed Horseshoes” decorative painting at Arts & Ales. 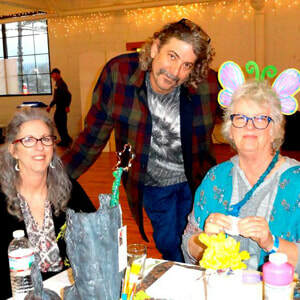 And, Frances Perea, Pat Bishop, and Margie Gallagher will be demonstrating how to create a whimsical fairyland, complete with fairies, fairy logs, and fairy houses. You will be charmed and amazed. Read more about that here. There will be much more to enjoy at Arts & Ales 2019. There will be two bands, lots of art to shop from, dozens of local and craft beers to sample, Floyd's Farm food truck* and Sweet Ellie's ice cream* ... don't miss it! Your good time will support an arts scholarship and arts participation in and around Franklin County. 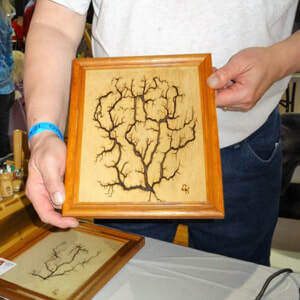 ​One of the unique things about Arts & Ales is demonstrations by local artists. As you sample the dozens of craft beers, listen to the bands, and shop for original art, you can also watch as artists create their work; in some cases, you can even help. 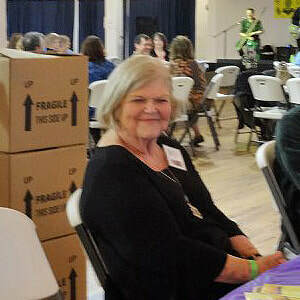 On March 9, at Monterey Station in Cowan, TN, you can meet the Fairies of Lullymore. The Fairies of Lullymore are the creation of Winchester artist Frances Perea. Come meet these enchanting fairies from Lullymore, County Kildare, Ireland and find out how they came to live in America. They are currently are boarding at the Artisan Depot Gallery, 204 E. Cumberland Street, Cowan, TN, and are seeking forever homes. 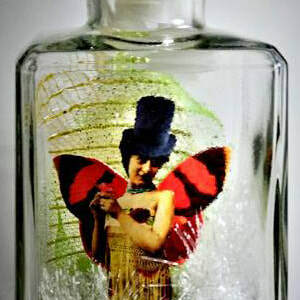 ​Frances will be offering Arts & Ales attendees an opportunity to make fairie artist trading cards as part of the "mob art" activity, with all materials provided. Also, Artisan Depot gallery member Margie Gallagher will be creating a blue tape "mob art" tree and participants who make the artist trading cards will have an opportunity to show them off by pinning them to the “tree.” Margie will also be demonstrating how to make fairy houses from natural materials and Pat Richards will demonstrate how she creates fairy logs. This year's Arts & Ales is sure to be a magical event. Don't miss it. Reserve your tickets today. Your good time will make possible the scholarship program of the Franklin County Arts Guild, as well as other arts activities in and around the community. Monterey Station is located at 104 Monterey Street in Cowan, TN, just off the main road (Cumberland Street/41A) that runs through Cowan. Click here for a map. Can you sell art without doing any marketing? "Build it and they will come" sounds great, doesn't it? Put your artwork in a gallery and boom! Sold! It's a lovely fantasy. If only life were that easy. "I'd rather be in the studio." Who wouldn't? "I don't have time." Yes, you do. "I am not technically inclined." Not necessary. "Marketing is expensive." It can be, or it doesn't have to be. Let's address each of these impediments to doing marketing. "I'd rather be in the studio." If you're an artist, you probably would rather be in the studio than pretty much anything else. But you have a life. In fact, you probably have another job, because you don't sell enough art to pay all the bills. If you sold more, you might be able to be a full-time artist and, sure enough, that is HARD. But even if you only make enough from your art to pay for a fancy trip every year, or a new car now and again, wouldn't that be great? Selling more art pays for your hobby/supplemental income/art job and, to sell more, you need some marketing. Stuff doesn't sell itself. Can you carve out 10 minutes a day for marketing your art? 30 minutes? An hour once a week? Maybe the time you spend on Facebook, looking at funny cat videos (guilty here) or reading political rants could be redirected to promoting your art. How much time marketing takes depends on what types of marketing you choose to do, and how labor-intensive each marketing method is. Let's face it, much of life takes place in the digital world today, advertising most especially. You don't have to be Bill Gates to do online marketing (social media, a decent website, etc.) but you should have at least a comfortable acquaintance with your computer, tablet, and/or smart phone. With the ability to work a little bit with images (sizing, cropping and so on) and knowing how to upload those images to your website, Facebook, and Instagram, you're already pretty far down the pike (and farther than artists who don't promote themselves). First ask yourself, what is the cost of not marketing? Lost opportunities are incalculable, but it's a no-brainer that no investment in marketing means fewer sales. There are many ways of marketing that carry no out-of-pocket cost but do cost in terms of time. There are other ways of marketing that cost something; how much you can afford to spend depends on what you can expect to receive in return. We will cover some of the more cost-efficient ways of marketing your artwork in the next installment of this blog. In the meantime, be thinking of how much you want to sell your artwork, and why. Guild member Kim Phillips will be exhibiting her work from March 1 through April 14 at the Guild’s gallery in Cowan. The public is invited to the opening reception on Friday, March 1 at 5:00 pm; refreshments will be served. The theme of the show, “Olio,” refers to the fact that the exhibit includes many objects that are unalike: paintings, graphite, clay, mosaic, pastels, and more. Said Ms. Phillips, “Most professional artists stick to one medium, and for over a dozen years I did only papercut art. But there are so many things that capture my attention and plenty of good teachers to inspire me.” Teachers are, in fact, given special mention in this art show. Promoting the arts in Franklin County and beyond is a primary mission of the Franklin County Arts Guild. Ms. Phillips, as the Guild’s workshop coordinator, is aware of the influence teachers can have on artists. “For example,” said Ms. Phillips, “skills learned in one medium can be helpful in others. What I learned about composition and color in papercutting apply very well in mosaics and even in Zentangle.” She continued, "I hope every artist in the Guild who can teach a creative skill will sign up to do that. Helping others develop their artistic talents is one of the most satisfying things an artist can do." ​Ms. Phillips, a Nashville native, moved to the Cowan area about three years ago. "What was so surprising to me," she said, "is how many artists live and work in this area. While our arts guild may be small compared to some, it's mighty. We have shows for students, members and the community at large, we give a scholarship each year, we offer classes, and we get together to do art every Wednesday. We are all volunteers, and you won't find a more dedicated bunch of people." 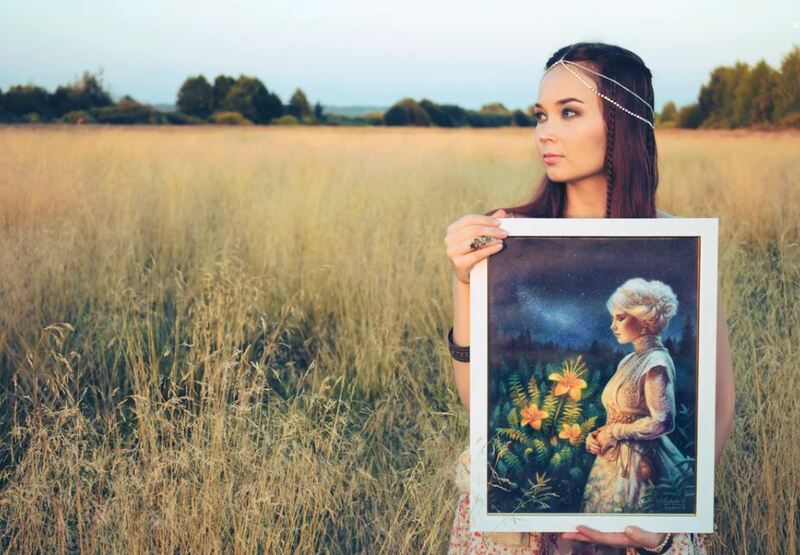 ​On Saturday, March 2, the Artisan Depot in Cowan will host Huntsville pastel artist Jodi Nuttall for a landscape workshop. The class, which runs from 1:00 to 4:00 pm, will cover various techniques with different pastels, with a choice of landscape scenes for reference. The cost for the workshop is $35 plus materials fee(s). For more information and to register, click here. 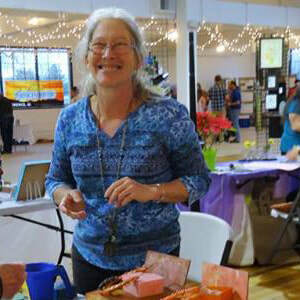 ​A native Huntsvillian, Jodi shares studio space with her artist husband, David Nuttall, at Lowe Mill. In 1979, she was encouraged by a professional artist teaching a painting class at the University of Alabama at Huntsville to get a degree in fine art and paint for a living. Instead, she decided to work and just paint on the side. Painting was always there in the back of her mind and, after nineteen years at a local company, she quit to paint full time. 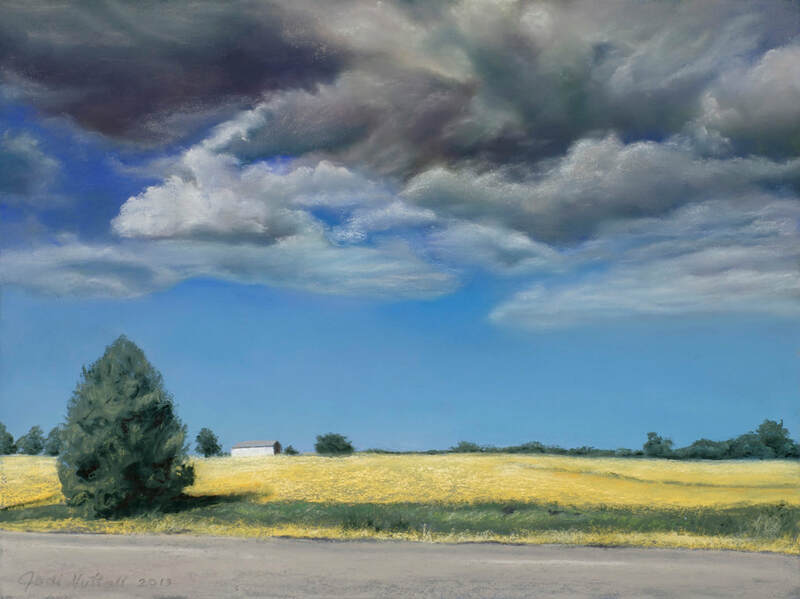 Jodi's current passion is painting landscapes and still lifes with soft pastels on “Pastelbord.” She also dabbles with abstracts and takes commissions. The immediacy velvety texture of the soft pastels, along with the directness of moving the pigment around with her fingers, are what she likes most. An oil painter for several years, she got tired of mixing paint and mediums to get the desired colors and consistency. To see more of her work, click here. Class size for the Pastel Landscapes workshop is limited to 10 people, and pre-registration is required. ​​​The Artisan Depot is the gallery and gift shop of the Franklin County Arts Guild and is located at 204 Cumberland Street E in Cowan, Tennessee. Questions? Email workshop coordinator Kim Phillips at franklincoarts@gmail.com with "Workshop Question" in the subject line. On Saturday, February 9, textile artist and educator Christi Teasley will lead participants in a print-making workshop at the Artisan Depot in Cowan, Tennessee. The workshop, Stamp It!, runs from 1:00 to 4:00 pm. 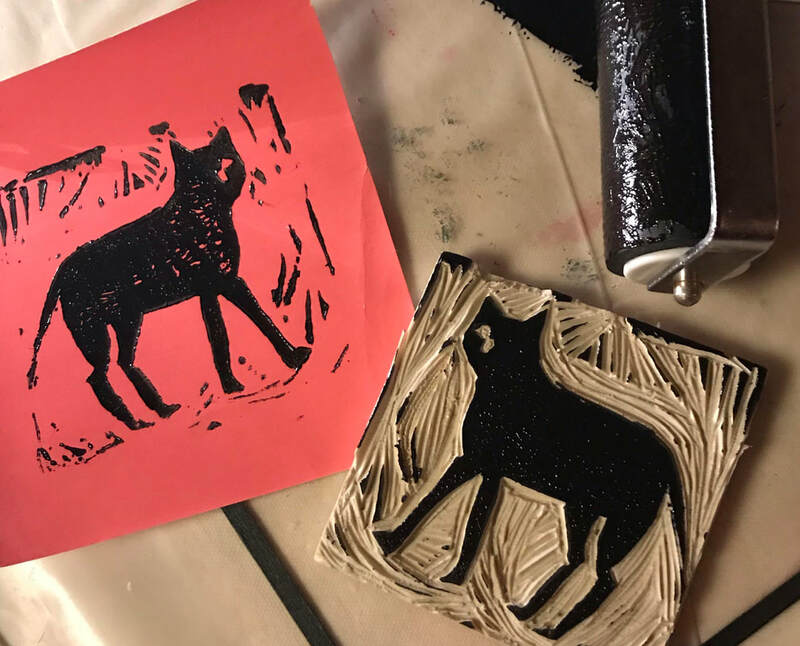 Participants will discover how to carve blocks of linoleum and use those--and other materials--to create one-of-a-kind artwork. Images will be printed on items including tea towels, notecards, and other substrates. Please visit www.franklincoarts.org/workshops to register; pre-registration is required. From her studio in Monteagle, Tennessee, ​Christi's practice centers on crafting works of cloth and paper, utilizing new and traditional processes of natural dyeing, printing, mark-making, stitching and constructing. Dish towels, valentines, tuffets, and large works for walls share her time, attention, and space. ​Christi discovered her love of repeated patterns and printing fabric as a high-school student at St. Andrew’s-Sewanee School (SAS) and honed her study of textile dyeing, printing, surface design, and construction at the Rhode Island School of Design (RISD). Christi received a BFA from RISD and later returned to earn a MA in Art Education. She taught studio art and directed SAS Gallery and Visiting Artist Program at St. Andrew’s-Sewanee School. She now continues to work on the leadership team for Shakerag Workshops, a top-notch series of studio workshops for adults which are held on the SAS campus each June. ​​The Artisan Depot is the gallery and gift shop of the Franklin County Arts Guild and is located at 204 Cumberland Street E in Cowan, Tennessee. Questions? Email workshop coordinator Kim Phillips at franklincoarts@gmail.com with "Workshop Question" in the subject line.